Places of worship are decorated like palaces while orphanages, government schools, old age homes and even some government hospitals suffer from capital crunch, inadequate infrastructure and lack of support from the crowd. This has been the state of things around the world for a long, long time. So, when ‘Temple of India’ was launched, founder, Hatim Attarwala, wanted people to realise that true worship necessitates the imbibing of humanity – one thing that every single religion preaches and promotes. He aims to make humanity the prime belief of every human being on the planet so that no child goes hungry. As Attarwala says, “If we can share, then let us do it. If we have the ability to make a difference, let us then not stop short”. 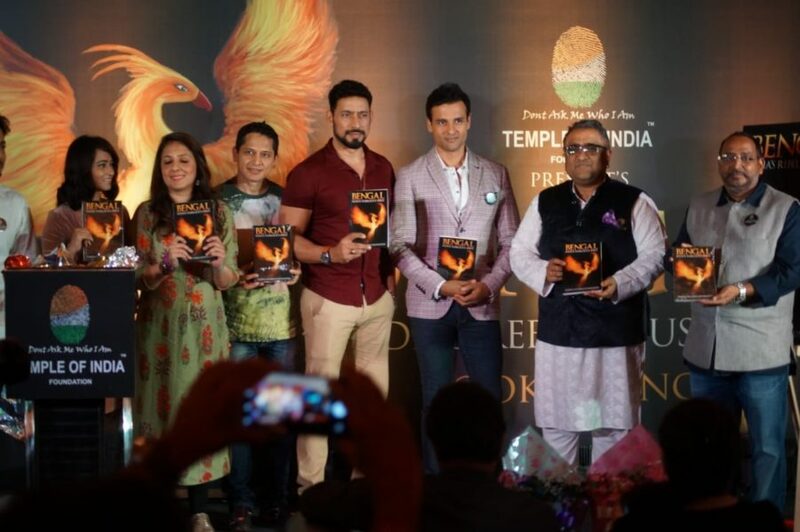 In order to become a self-sustaining non-profit organisation, ‘Temple of India’ has launched their first book, ‘Bengal: India’s Rebellious Spirit’. Proceeds from the sales of this book will be used towards the running of the organisation, upliftment of backward communities in West Bengal and feeding the poor and homeless people in Mumbai. Actor Rohit Roy, who launched the book, was impressed with the work of the foundation. “It is amazing what Temple of India is doing. I hope they achieve success in all their endeavours and help as many people as they can,” he said. The launch was a mighty success with celebrities such as Kunal Ganjawala, Hrishikesh Pandey, Harshali Zine, Munisha Khatwani, Vinod Singh, Akshay Sethi in attendance. The celebrities caught up with the initiatives of the organisation and also gave their valuable inputs. On the same note, the organisation has also unveiled their new line of bed linen and women’s wear which features exceptionally beautiful hand-embroidery done by a small community of Bengali artisans. Returns from the sale of these products will directly benefit the artisan community which currently comprises of families who mostly belong to the backward sections of the society. Temple of India also intends to introduce modern technologies without impeding the craftsmanship which is proudly passed from one generation to another. Since its inception in March 2018, Temple of India has already started bringing a transformation in the lives of families who live on the streets of Kharghar – where the organisation is headquartered. Free meals are distributed to the families, sparsely used clothes are given to those who are in need and medical campaigns are regularly held to help the destitute. Members and volunteers also visit the Kharghar Zila Parishad School to teach skills like dance and yoga. The upcoming projects include installation of refrigerators in communities under their ‘Fridge Project’ programme which will allow all residents of the community to leave food in the fridge instead of throwing it away. With several hungry people on the road, food from the fridge which would have otherwise been dumped in the garbage bags can be distributed to the less privileged people who cannot afford food. Encouraged by the spirit of humanity, the young organisation also plans to open a shelter home for old citizens and for orphans. They will be completely cared for, children will be educated and medical assistance will be provided to patients living in the shelter home. The organisation seeks support from the government, local authorities, societies, corporates and workplaces in their endeavours to transform India by empowering those who currently live on the brink of survival. To support their vision you can reach out to Attarwala directly or to any of the members of the organisation.